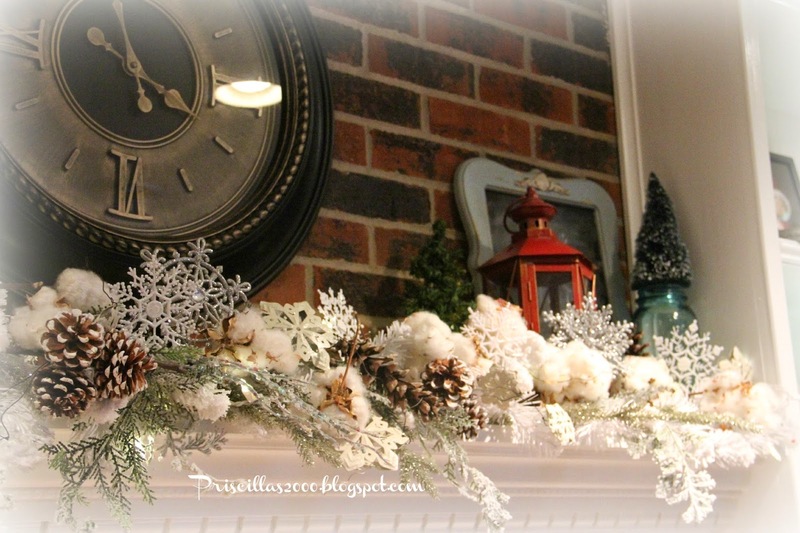 I am sharing our mantel decorated for winter today .. I was so excited this week to finally find some cotton branches! I actually wanted the artificial cotton but there is no store around here that has it, and shipping at all the places I found it is outrageous ! So I found 2 branches at Hobby Lobby for $4.95 each ( they were half off) .I have only been looking for cotton since October ..I can't even tell you how many times I have been in Hobby Lobby since then !! 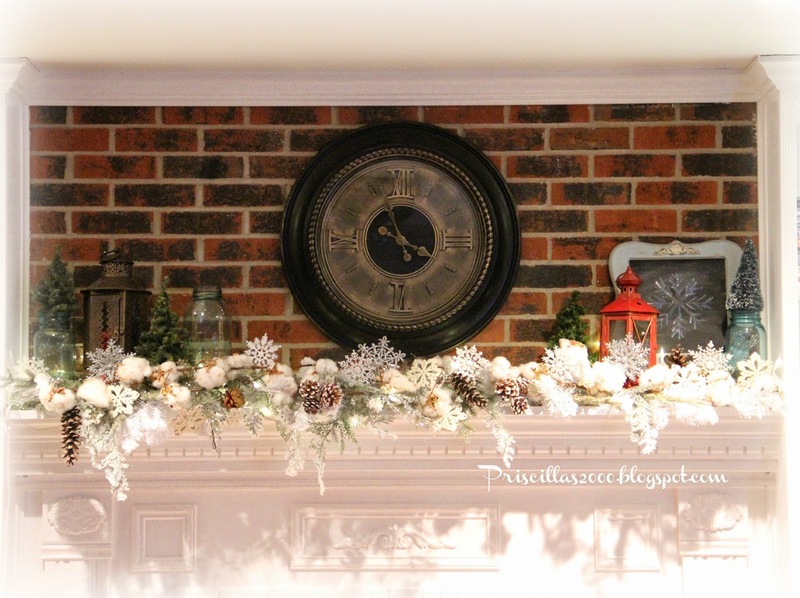 I left the white garlands , glittery branches , pine cones and white lights from our Christmas mantel. I added alot of snowflakes and the 2 cotton branches. I put the clock back up ..and used vintage blue mason jars filled with bottle brush trees and a couple lanterns. 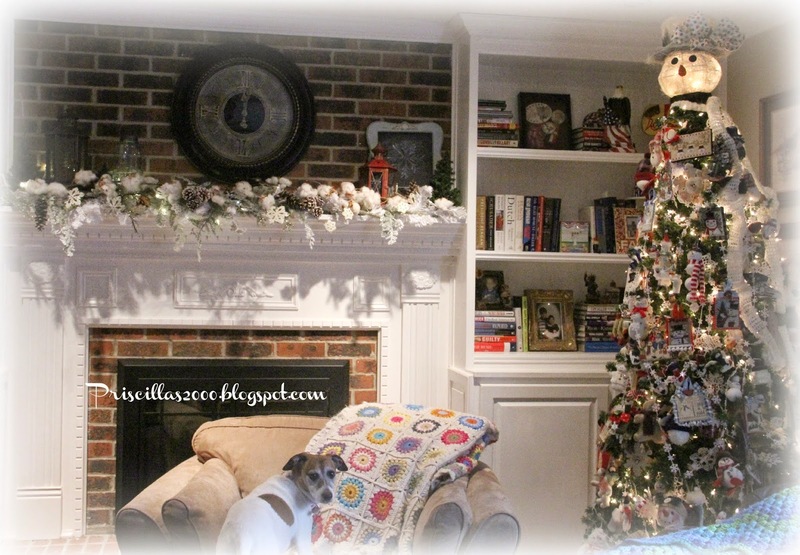 I still have 2 trees up .. this snowman tree and the ice skate tree in the dining room. Thanks so much for your visit ! I Hope you have a wonderful day ! Great winter display! The cotton does look like little snow balls! I wonder how long it takes to take down your trees? And WHERE do you put all the decorations? Do you have an extra storage shed just for them? Hugs! I had to laugh at the above comment as I just did a post on Where Do i keep it all!! 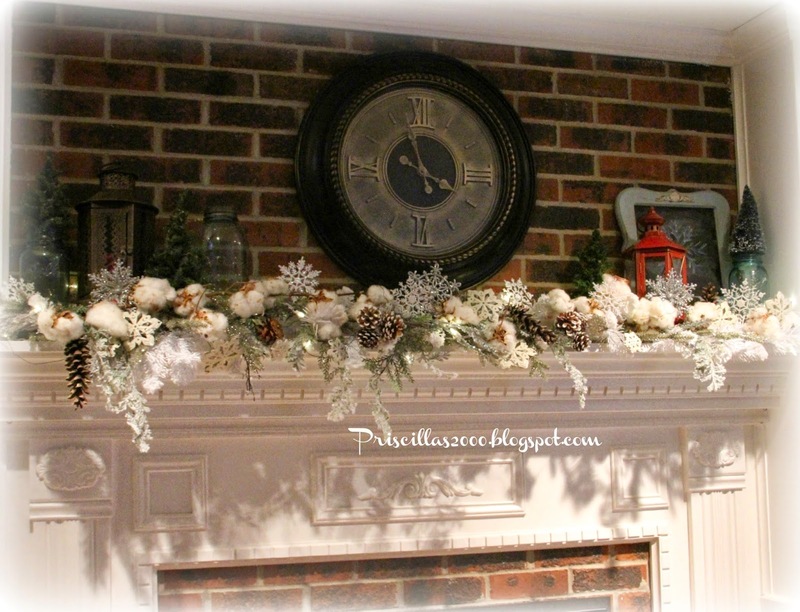 Love your Winter Mantle.... so pretty!! we just had 6 inches of snow and 4 more are expected on Monday!! Dear woman, where do you put all of your things. They are beautiful. The snowman tree and skating tree i would leave up to. You have a special touch for decorating. Great ideas. sparkle and shine i always say. Priscilla - thx for continuing to post. You keep me inspired. 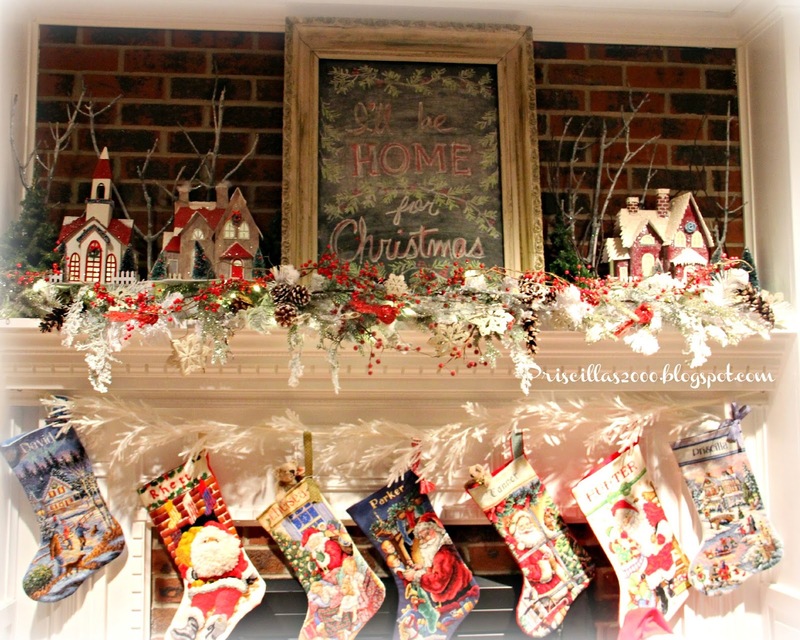 Your winter mantle is so pretty! I love it! 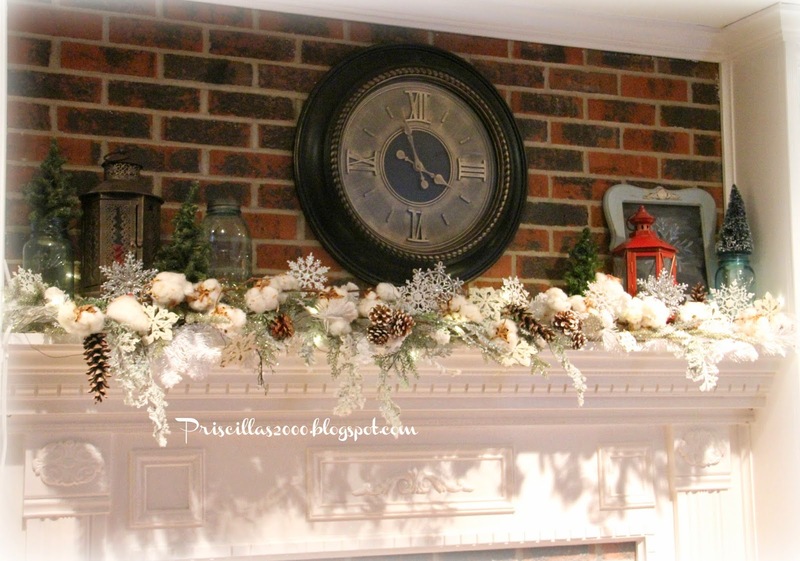 Hi Priscilla I love your winter mantel! You have such a style that I just love. Have a wonderful week. It looks beautiful! Thank you for joining Home Sweet Home!